Drugs baron Abdullah Baybasin faces a 22-year jail sentence after being convicted in London earlier this year. He is the latest member of the Baybasin family to be locked up in Europe. His brother Huseyin, once described as "Europe's Pablo Escobar", is in a Dutch prison. For years their name struck terror in the hearts of many people in London's Turkish and Kurdish community. They exerted such a malevolent influence that people would refer to them, often in hushed tones, simply as The Family. The Baybasins have their roots in the rural south-east of Turkey. In the 1970s the clan began refining heroin in remote farmhouses in the Lice district, close to the Syrian border. By 1998 they were making millions from exporting heroin to Europe. Huseyin Baybasin, known as Europe's Pablo Escobar after the late Colombian drug kingpin, set himself up in business in Amsterdam. His brother, Abdullah, had arrived in Britain, via Gibraltar, in 1997. Abdullah, who uses a wheelchair after being shot by a rival, immediately claimed asylum and in recent weeks there have been reports in the British press that he was given preferential treatment because he was an informant for Customs and Excise. A spokesman for HM Revenue & Customs told the BBC News Website: "In common with other law enforcement agencies, it is the policy of HM Revenue & Customs (formerly HM Customs & Excise) to neither confirm nor deny the use of human sources of intelligence. HMRC will therefore make no comment on these reports." Huseyin Baybasin, known as "Europe's Pablo Escobar"
The now-defunct National Crime Squad said he was widely believed to have controlled the lion's share of Britain's heroin trade. Baybasin lived in a large house in Edgware, north London, while his asylum application was being dealt with. 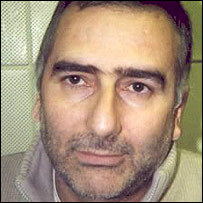 In July 2002 Huseyin was jailed for life in Holland after being convicted of drug smuggling. But he is believed to have retained most of his vast wealth, which he invested in tourist resorts along the Mediterranean and Aegean coasts. 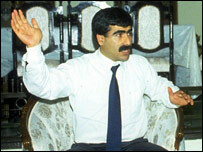 Both brothers have alleged that high-ranking members of the Turkish government were involved in the £25bn heroin trade. Once in London, Abdullah recruited a gang of young thugs known as the Bombacilar (Bombers) who spread fear throughout the Turkish and Kurdish community. The Bombacilar would force their way into shops and small businesses armed with weapons, demanding money. On one occasion, a gang of up to 20, armed with samurai swords, metal bars, pool cues and a gun, forced their way into a Turkish cafe in Stoke Newington. One man had his index finger chopped off by the gang and several shots were fired. Shopkeepers, cafe owners and other small businessmen received death threats and some paid up to £10,000 a year to the extortionists. One businessman, known as Mehmet*, told the BBC News website: "They were dangerous people. They had a very bad name in the community." Some of their victims expressed their resentment to supporters of the powerful Kurdish nationalist PKK/Kadek movement. Matters came to a head on 9 November 2002 when the Bombacilar clashed with their PKK/Kadek rivals. A mass brawl broke out in the Green Lanes area of Haringey, north London, and one man, Alisan Dogan, was killed. Scotland Yard stepped up efforts to gather intelligence on the Baybasins. 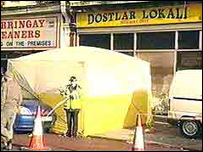 In December 2003 they carried out a series of raids and arrested several people. Guns, machetes, stolen mobile phones and counterfeit money were seized and police also discovered what they believed was a torture room. The legal process began and last month six members of Abdullah Baybasin's gang were jailed for a total of 68 years after pleading guilty to offences involving guns, violence, extortion and blackmail. Two of his thugs were convicted of the attempted murder of a Turkish man on the forecourt of a petrol station in Tottenham in October 2003. 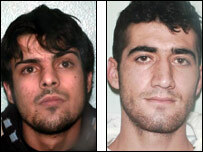 Erdal Ozman, 25, from Wood Green, was jailed for 15 years and Ibrahim Aslan, 21, of no fixed abode, got 13 years. Abdullah Baybasin himself slipped up. For years he had ensured he was never seen in the same room as the heroin he dealt in. But one day in March 2001, Baybasin allowed himself to be implicated in a deal involving 2.5 kilos of heroin. Earlier this year, the 35-year-old pleaded guilty to drug importation at Woolwich Crown Court and on Friday he will be sentenced. The court will be heavily guarded by armed police who have appeared at all of his court appearances. Mehmet told the BBC News website he was very relieved to hear that Baybasin's gang had been jailed, but he added: "There are other groups, like the Tottenham Boys, who are still out there and they're very nasty." But local councillor Nilgun Canver said the level of violence had gone down since the police moved on the Baybasins and she added: "The police and (Haringey) council have given assurances that we are taking action and working together with traders and residents to improve the area as a whole." Detective Chief Inspector Robin Plummer, of the National Crime Squad, said: "For years Baybasin and his followers intimidated and victimised members of the Kurdish community in north London. "Law enforcement has invested much time and effort in reaching out and demonstrating that nobody is above the rule of law." * Mehmet is not his real name. We have changed his name for security reasons. As the price of cocaine falls, it is also becoming less pure. How does cocaine get to the UK?